This gorgeous gemstone bracelet would make the perfect gift or treasured keepsake for a birthday, special anniversary or for a special girl in your life! Our gorgeous zodiac charm bracelet comes in a pretty, quality black gift box hand tied with a lovely off white grosgrain ribbon and a Zodiac gift card attached, it makes a perfect gift to give. The gemstone in the bracelet matches the Zodiac star sign charm. For example pink opal for Libra. We have substituted emerald green apatite for emerald and sapphire blue iolite for sapphire as the colours and quality of those gemstones are superior to the emerald and sapphire gemstones. 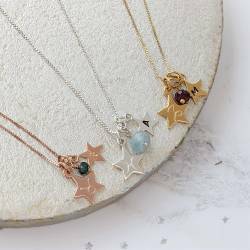 The gift card will refer to the Zodiac Star sign you have chosen and will give a little bit about that star sign, including the most flattering characteristics for the star sign. 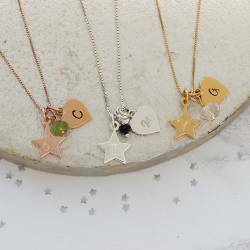 Once we’ve created the perfect personalised bracelet for you, we’ll carefully package it in one of our beautiful black gift boxes with a zodiac gift card for the month you select. We’ll then finish it with a flourish of ivory ribbon ready for you to give to the lucky lady. The Zodiac disc is approx 1cm and hangs approx 1.5cm from the bracelet.